05/2018 Xiaoyu defended his thesis and became our first PhD. Congratulations! 05/2018 Lu's paper on acoustic wave imaging appears in PNAS. Congratulations! 12/2017 Zhaodong's paper on perovskite solar cell appears in Nature Communications. Congratulations! 09/2017 UT-Austin is awarded an NSF MRSEC. We are very proud to be part of it! 09/2017 Zhaodong's paper on photoconductivity imaging appears in Advanced Materials. Congratulations! 05/2017 Xiaoyu's paper on YMnO3 domain walls appears in Science Advances. Congratulations! 08/2016 Di's paper on MoS2 field-effect transistors appears in PNAS. Congratulations! 02/2016 Prof. Lai wins the 2016 Presidential Early Career Awards for Scientists and Engineers (PECASE) award! See White House Press Release and UT Press Release for more details. 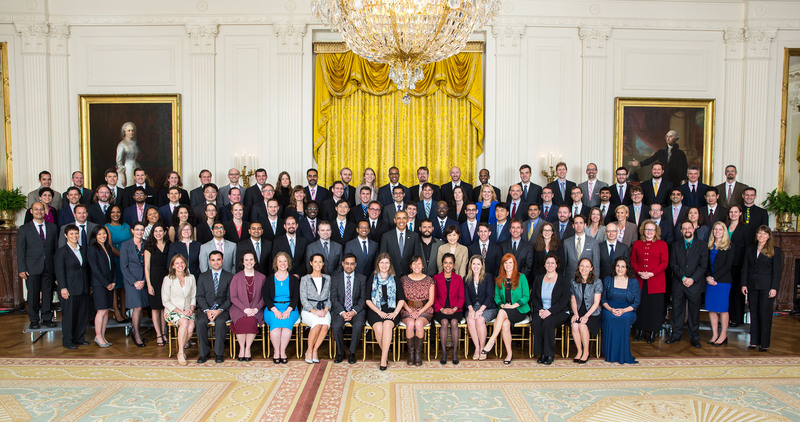 President Barack Obama joins recipients of the Presidential Early Career Award for Scientists and Engineers (PECASE) for a group photo in the East Room of the White House, May 5, 2016. 03/2015 Prof. Lai is awarded 2015 IUPAP Young Scientist Prize in the Structure and Dynamics of Condensed Matter (C10) "for his outstanding contribution in nanoscale impedance imaging of strongly correlated and low-dimensional quantum materials"! See APS News for more details. 07/2014 Our first paper is published in Nano Letters! 05/2013 Prof. Lai receives the Department of Energy (DOE) Early Career Research Program Award for his proposed work entitled "Microscopy of Electrostatic Field Effect in Novel Quantum Materials"! 04/2013 We receive our first external grant from the Welch Foundation! 09/2012 The Nanoscale ElectroMagnetic Lab (NEML) led by Prof. Lai is founded at UT-Austin.